John wanted Jesus to baptize him, I mean after all John’s baptism is a baptism of repentance, of confessing our sins. Does Jesus really need to confess sins? Does Jesus really need to be baptized? But it is proper to do this to fulfill all righteousness! What does that mean? To fulfill all righteousness. To make all divine sinless things come to be. Jesus did not need to confess sins or be made clean. But in order for the divine plan to proceed forward this was a step that needed to be done. Doesn’t mean we need to understand it. We just need to know that Jesus is God’s beloved son and through Him we can have a relationship with God. Have you ever known someone that left town, your hometown, and then many years later they came back and started acting differently or saying things that you couldn’t believe? 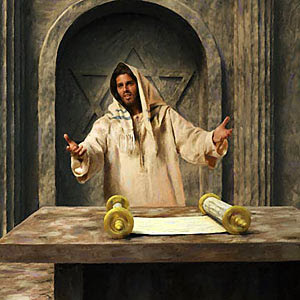 Imagine how those in the temple at Nazareth felt about Jesus that day. He read the passage from the prophet Isaiah, about bringing good news to the poor, to proclaim release to the captives and that the blind will receive their sight. That the Lord’s favor has come, and it has come through me! They knew Jesus and had grown up with him. how could this be? We have a hard time allowing God to be God if we keep trying to fit Him into our box. Which means He can change people and use them to do His will. Even those we think it isn’t possible for Him to use. I mean really for every person that you think God can’t use, there is one person who thinks you are the one God can’t use. Allow God to fulfill His promises as He chooses and don’t try to put Him in your box. A lot of places I read about this verse talk about us living in such a way that we will be the salt of the earth and the light for the world. If we can only do what Christ calls us to do, and follow all of the commandments and not lead any of our brothers or sisters away in sin, then we might be salt and light. But read the passage again. There is no hesitation. There is no you can be. There is no you will be. You are the salt of the earth and the light to the world. So go and show the world whom you follow and whose you are!